I challenged myself to come up with a creative recipe for pizza made with dough from scratch and local ingredients for the Foodbuzz Challenge #5 Pizza Recipe Remix blog contest. Although, I won a few trophies I didn’t advance to round 5. 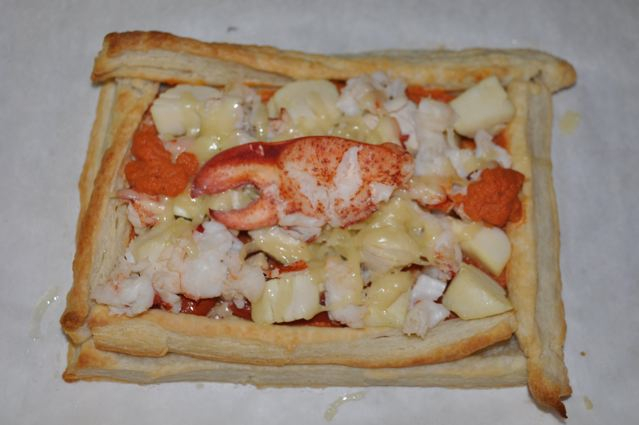 I had so many cool ideas for pizza and decided to make my most unique invention just for fun, “Bouillabaisse” puff pastry pizza. During the research phase, I knew I wanted to make a pizza using puff pastry but didn’t know whether I’d make something sweet or something savory. Then, voila, just like that I hit on something that not only got me really excited but would be challenging and visually beautiful. My pizza would turn some of my favorite ingredients into not any corner New York pizza joint’s pizza but a luxurious pizza that one might find in a Parisian restaurant. 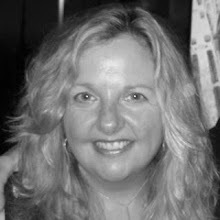 So what’s in a bouillabaisse pizza? It’s a pizza that has all the fragrant ingredients found in a Mediterranean or Provencal bouillabaisse soup but in quantities more fit for a pizza than a soup. For the toppings, I steamed a Maine lobster from my neighborhood fishmonger and Long Island scallops and swordfish from Shinnecock’s Blue Moon Fish at Union Square Farmers Market. The steaming liquid was a fragrant “court bouillon” made with white wine, water, fennel, orange zest and saffron,all ingredients in a traditional bouillabaisse. And, for the vegetable toppings, I roasted and chopped seasonal vegetables from the farmers market to add to the bites of seafood: plum tomatoes, fennel and red pepper. 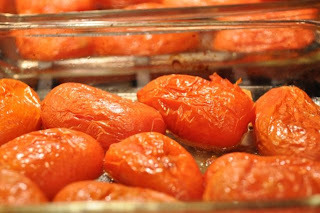 I was very excited to get late season local, greenhouse tomatoes although good quality canned plum tomatoes, preferably organic, can be drained and squeezed and used as a substitute for fresh. I made the sauce from the roasted plum tomatoes, red pepper and fennel. To keep the fennel moist, I added a hint of wine and garlic to the pan. Garlic and wine are used liberally in bouillabaisse. With the help of Julia Child’s Baking with Julia cookbook, a full day ahead of time I got to work on making the puff pastry "pizza dough". 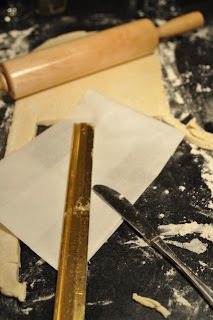 I love the challenge of a hand rolled, folded and turned puff pastry made with flour, water and butter. However, it is very time consuming and easy to mess up. 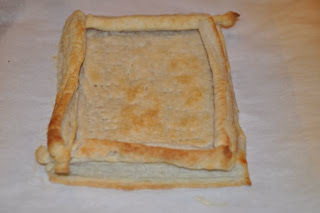 To save time, I suggest buying a good quality puff pastry that’s pre-made. Many of the finer supermarkets carry puff pastry (my Whole Foods sells Dufour Pastry Kitchens, a local, New York City brand). To create visual excitement and convey the contents of my pizza, I made tiny puff pastry lobsters, scallops and fishes using cookie cutters. 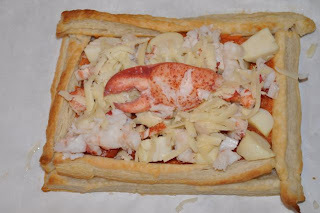 For me, the best part of making the pizza was assembling the cooked pizza on a serving platter and garnishing it with the puff pastry seafood creatures. Magnifique! Like most pizzas, this Bouillabaisse pizza recipe is best when it’s made fresh and served immediately as puff pastry is more fragile than traditional dough. Everything can be prepared ahead of time, and the crust baked and pizza assembled just before serving. Make your own puff pastry. You’ll need the following ingredients to make your own dough and a reliable recipe (click here for a step by step recipe from Julia Child with photos). 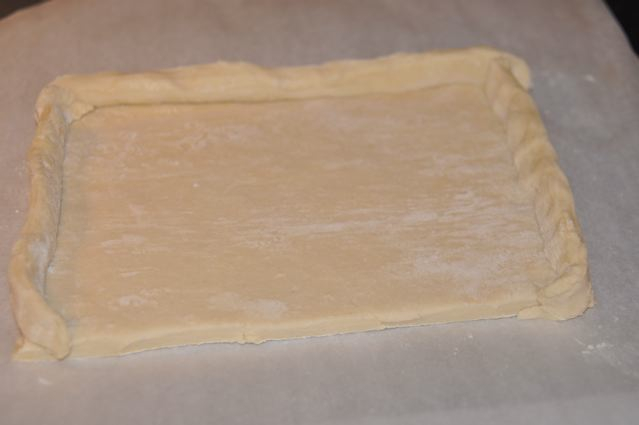 Thaw frozen puff pastry according to the package directions OR prepare homemade puff pastry. Roll puff pastry to a thickness between a quarter and an eighth of an inch thick. Cut your pizzas into whatever size or shape you like. I made 6 x 11 inch rectangles using a homemade pre-measured piece of parchment paper as a stencil so my crust would fit exactly onto my platter (recommended). I also cut four half inch by 6” pieces and four half inch by 11” pieces to “fortify” the perimeter of the rectangles with mini walls to visually (and literally) hold the sauce and toppings on the puff pastry crust. You can easily make individual or medium pizzas using whatever shapes and sizes your cookie sheets and imagination can accommodate – circles, squares, a large fish or scallop shape, even a fishing boat. That’s the joy of working with puff pastry. If your dough becomes warm refrigerate for 15 minutes and proceed. Warm dough will not puff. After making the pizza crust, bake immediately – directions below -- or refrigerate the newly cut shapes on a sheet of parchment paper. Proceed with making the optional garnishes using either additional puff pastry or scraps from making the crust. 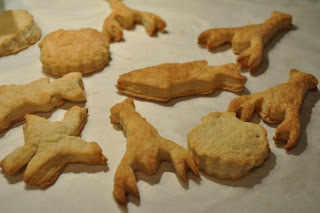 You can make puff pastry garnishes by hand or with fun shaped cookie cutters. Be sure to keep the dough cold and minimize the amount of handling to preserve the hundreds of layers that give puff pastry its “puffiness”. As with the crust, bake immediately or cover and store the shapes on parchment paper in the refrigerator until ready to bake. 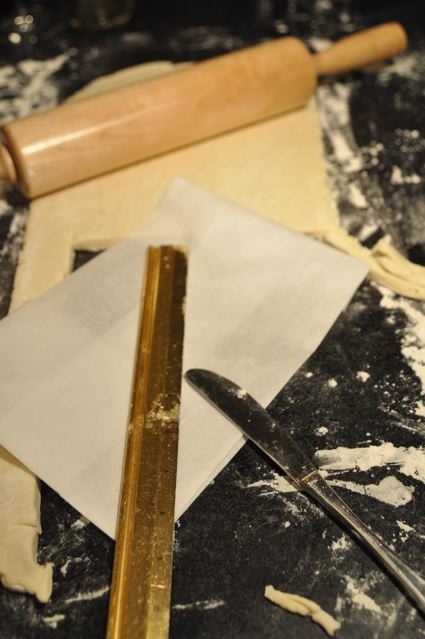 It’s best to roll and cut puff pastry as near to baking time as possible. 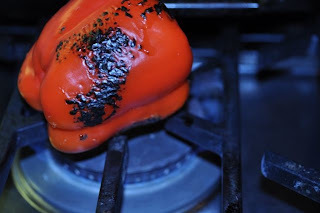 NOTE: The roasted tomato, fennel and red pepper will be used in both the sauce and the topping. Chop cooked tomatoes and fennel into ½ inch pieces. Set aside one cup of the diced tomatoes, one cup of the diced fennel and ½ of the red pepper for the sauce. The remaining ingredients will be used for the topping or stored for future use. 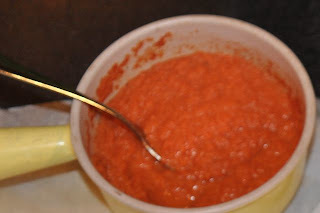 In a food processor, puree one cup each of tomato and fennel and half of the roasted pepper (deseeded) for a nice thick sauce. Season with salt and pepper. Seafood and cheese may be prepared up to three hours ahead of assembly. See the recipe above for the recipe for roasting the vegetables. Prep and measure the ingredients for the poaching liquid. Prep the seafood. In a 16-quart stockpot, add all of the poaching liquid ingredients and bring to a gentle boil. 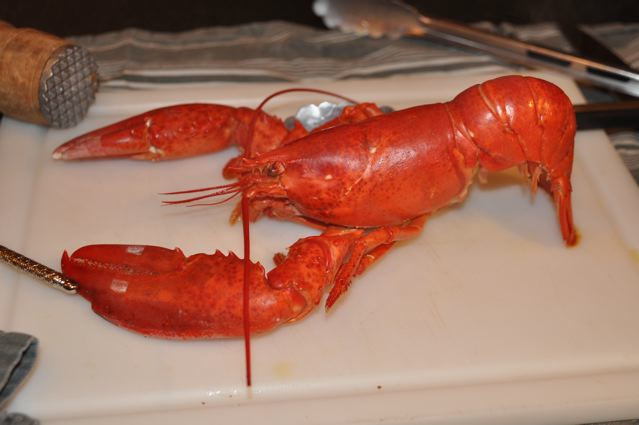 Steam the lobster for 9 minutes in the poaching liquid (larger lobsters take longer – add 3 minutes per pound) with a tightly covered lid. 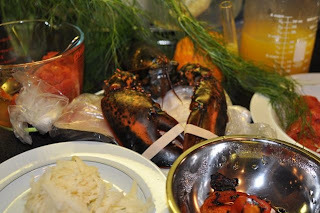 When the lobster is done, remove from the stockpot and let cool. Reserve the liquid to poach the scallops and swordfish. 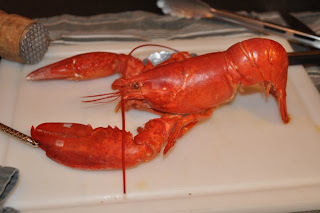 When the lobster is cool, remove shell being careful to keep the claw meat and lobster tail intact. Set aside. With the poaching liquid on a low simmer, poach the uniform ½ inch pieces of scallop and swordfish for 2 minutes until just cooked. Remove quickly with a slotted spoon and place in a colander to drain excess liquid. 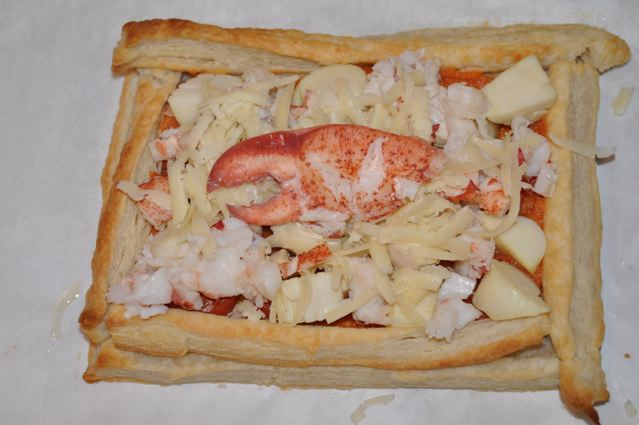 Cut the lobster tail and any broken claw meat into ½ inch pieces being sure to save any whole claws for the top. HINT: Save the lobster shells for stock to be used in another recipe. Grate the Gruyere cheese using the large holes of a box grater. Preheat oven to 375 degrees (F). 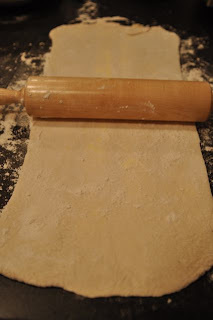 For thin, crisp crust, roll puff pastry to between one-eighth and one-quarter inch thick on a well-floured surface. Using a knife and ruler, and cookie cutters, make your puff pastry dough shapes. 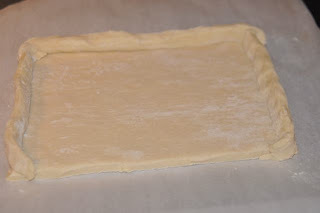 For the pizza crust, cut the bottom crust of the pizza to a 6 x 12 inch rectangle and cut miniature walls for the top of the crust (two – ½ x 6 inch and two ½ x 12 inch). You will need two crusts for this recipe. 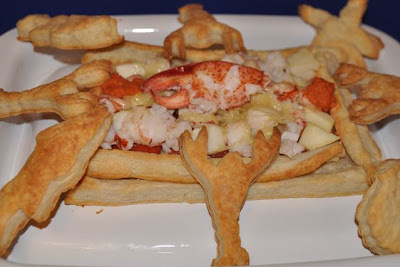 For the decorative cookies, use cookie cutters such as a lobster, fish, and seashells to add fun to your pizza presentation. Place crusts and cookies on parchment paper lined cookie sheets and pierce several holes in the bottom shell with a fork to deflate some of the puffiness and get a crust more like a traditional crust that better accommodates toppings. 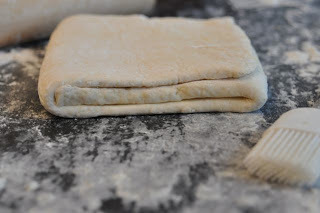 It’s important to work quickly with the dough as warm puff pastry dough turns to mush and will lose its puff. If necessary, return cut shapes to the refrigerator before baking to keep the dough chilled. 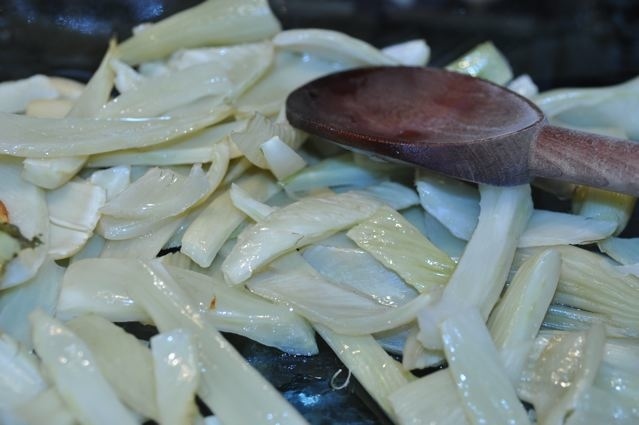 Cook pastry until golden brown and crisp (20-30 minutes or more depending on the size and thickness of the shape). Leave the crust on the parchment paper and cookie sheet since the pizza will go back into the oven to heat the toppings and melt the cheese. Set up your toppings in separate bowls or plates (roasted fennel, roasted tomato, roasted red pepper, lobster, swordfish, scallops, and cheese). Heat the sauce. Using a spoon and a rubber spatula or silicon brush, apply sauce to the crust. 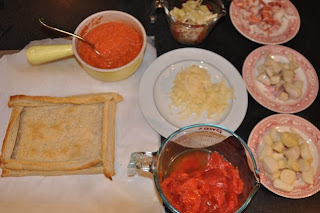 Then, add the toppings to the pizza in the proportions that you prefer saving the cheese for last (I used a small amount of Gruyere or about 2 ounces on each of the 6x11 inch pizzas so as not to overpower the seafood with cheese). Once assembled, put the pizzas in a 375-degree oven for about 8-10 minutes or just enough time to heat the pastry and toppings and melt the cheese. Be careful that the crust doesn’t burn. You can heat and serve any remaining toppings to serve along side the pizza for a hearty and complete meal. Two 6” x 11” rectangular pizzas serve 4 people.